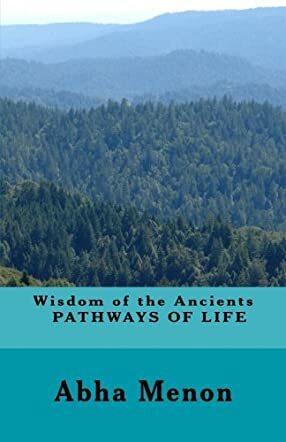 Wisdom of the Ancients: Pathways of Life by Abha Menon is a non-fiction book consisting of a hundred “shlokas” or verses from Hindu philosophy. Wisdom of the Ancients is well crafted and well organized with a clean style of presentation. Abha talks about her background briefly and how she imbibed the cultural and spiritual teachings of the shlokas from her mother, who was an expert in Sanskrit language. What follows is each of the hundred shlokas presented in Sanskrit, Hindi, and translated into English. These shlokas come from the rich Vedic and Puranas philosophy of Hinduism in India and contain valuable wisdom passed on from the ancient sages or gurus. They are meant to guide and serve as lessons in how to conduct oneself and one’s life to achieve peace and contentment for all. As such, these offer spiritual insights and advice on how not to get trapped in the material world. I loved reading Wisdom of the Ancients by Abha Menon and liked the idea that these were shlokas that Abha had grown up hearing as a child and so naturally this, combined with her mother’s teachings in Sanskrit, would enable her to provide an accurate translation from the original Sanskrit into English. The layout is clean and at the each of each short shloka is space for readers to reflect, contemplate, and write about how they can apply these lessons in their own life. These are much needed in today’s materialistic world and I certainly hope Abha comes out with more books on ancient Vedic teachings and translations if possible, so that readers all over the world may benefit from them.